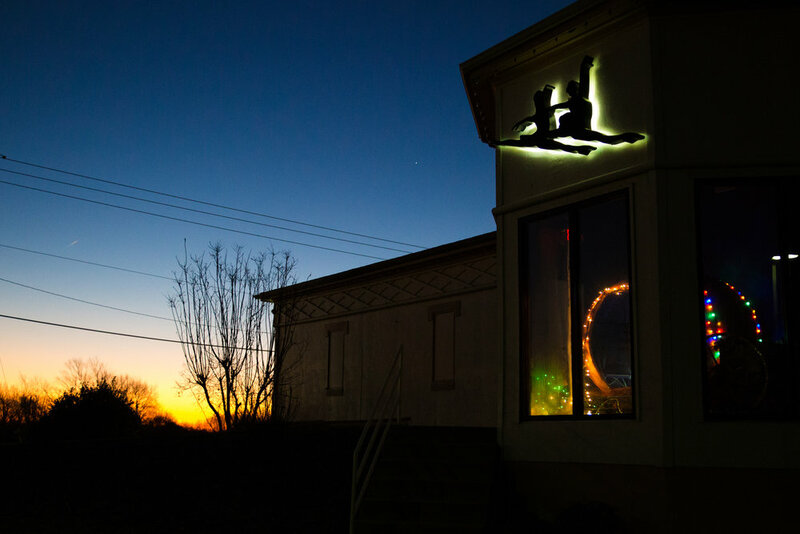 After seeing a clear need for a full scale dance education facility in the Gladstone and Northland region of Kansas City, in 2001 Ballet North designed and built a totally custom 11,000 square foot dance studio space specifically designed to facilitate ballet training and education. Comprised of 4 large studio bays, a large waiting area, bathroom changing areas and a private parking lot with 38 spaces, the facility won the Clay County Economic Development Council Keystone Award in 2002 and a Resolution of Thanks from the Missouri General Assembly. We are very proud to offer our comprehensive ballet training program in this award winning studio and performance space! We began with Ms Laura Luzicka (now Laura Reinschmidt) founding the Laura Luzicka School of Classical Ballet in 1977 located in the historic downtown square of Parkville, Missouri. Resisting the trend at the time of only wanting combo class type dance studios because, "No one will take 'only' ballet!" Ms Laura very successfully established the Northland's ONLY specialty ballet school. So much so that in just a few short years she was compelled to re-locate to the Parkville Heights Shopping Center in 1981 due to both studio growth and strong technical development requiring a larger space for classes. This upward trend would continue apace resulting in the Classical Ballet School moving to the 72nd and North Oak location in 1986. In 1994 Ms Laura and Mr Matt worked together to form up and create the non-profit organization that has continued and further advanced their vision of a sustainable, complete classical ballet training and performance organization, Ballet North. Now in addition to offering an ongoing, complete classical ballet education from ages 3 to 18, each year Ballet North conducts touring performances to the Platte County, Park Hill and North Kansas City school districts and parts beyond, plus full-length theatrical performances for general audiences at venues such as the Excelsior Springs Performing Arts Center and the Liberty North Performing Arts Center. In 2016 an international partnership was begun with Moscow Ballet to present the Great Russian Nutcracker to Kansas City audiences at the Midland Theater. To date, Ballet North has performed for well over 80,000 children during the run of our annual School Tour performances and presented virtually every full length classical ballet repeatedly to the public from Giselle to Sleeping Beauty, Swan Lake, Les Sylphides, Paquita and Coppelia to original productions by Ms Laura of Beauty and the Beast, Cakewalk, Carmina Burana, Cinderella, Life in the Old South, The Nutcracker, Peter Pan, Peter and the Wolf, Stars and Stripes and Watermark. Students trained by Ballet North under the direction of Ms Laura and Mr Matt have been accepted to elite summer ballet study programs, many times on part or full merit scholarships, at Pacific Northwest Ballet, School of American Ballet (SAB) in New York City, Boston Ballet, San Francisco Ballet, The Kirov Academy in Washington, DC; Central Pennsylvania Youth Ballet, The Rock School of Ballet, Tulsa Ballet, Ballet Austin, American Ballet Theater in New York City, Next Generation (Florida), Houston Ballet and the Royal Winnipeg Ballet in Canada. Significant to full scholarships for dance have been awarded to Ballet North graduates to attend the University of Utah Dance Department, University of Missouri Kansas City Conservatory of Dance, The Ann Lacey School of American Dance at OCU, Washington University in St Louis, and the University of Missouri. Professional contracts have been given to Ballet North graduates by Boston Ballet, San Francisco Ballet, Tulsa Ballet and Milwaukee Ballet. From 1997 through 2006 Ballet North worked with the Kansas City Kansas School District on the Whittier Elementary/Central Middle School campus to offer a ballet, arts, mentoring and education program concept called the Three Faces of Dance. Involving regular special ballet classes and the study of the fundamentals of stagecraft and story telling, the Three Faces of Dance stimulated academic development among participants and produced documented instances of avoiding gang life and gang initiations, underage pregnancy, truancy, and gained academic success through high school for participants who later went on to college thereby breaking the poverty welfare cycle of their respective families. The Three Faces of Dance was supported by the Muriel McBrien Kauffman foundation, and a strong partnership with the Kansas City Kansas School District. The Three Faces of Dance proved in a real "trial by fire" that involvement in the arts with a mentor based, regular and sustained program can produce a total reversal in sociological trends and break the poverty cycle within families by way of much improved scholastic performance and individual choices among the participants. The severe distractions constantly provided by the urban core of all American cities with violent crime, pervasive gang culture, and economic blight can be greatly improved and even remedied if young people have a viable option to choose that is within their grasp.